You, the Living, distinctive Swedish auteur Roy Andersson's latest comedy of despair, doesn't stray far from his usual work, appearing to be cut very much from the same mold as his Songs From the Second Floor, despite the fact that seven years have passed since that film's release. Comprised, as usual, as a series of creaky tableaux, the film chugs along with an amusing, deadpan sensibility that sees its cast of pallid, depressed miserables endure the agony and disappointments of modern life. Andersson creates a decidedly artificial world, and it is at its funniest when it is most hermetically sealed off from reality. For example, one episode featuring a despairing daughter and her senile mother cuts too close to the bone to inspire many chuckles, even if one can abstractly grasp the comedy that arises as she unsuccessfully begs her ailing mum to recall her childhood miseries. Unfortunately, after a jaunty, semi-musical first half-hour, despair becomes the prevailing emotion. By the one-hour mark the returns have diminished pretty severely. The deliberate pacing, which actually served the comedy well in the early scenes, becomes something of a liability as the laughs becomes more sporadic. The dull, dingy pastel color scheme becomes increasingly suffocating. The vignettes become ever more mundane. The injection of political commentary into the pastiche does little to shake the feeling that this is a live-action cartoon. What Andersson achieves here is occasionally funny in the same way that Jacques Tati's movies are funny, but it rarely manages that master's level of visual complexity or wit. Nonetheless, despite any shortcomings, this is not a work to be ignored. 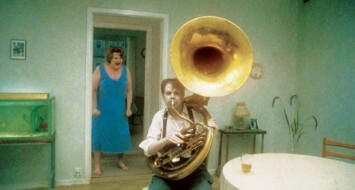 Andersson's detailed, largely static compositions beg to be seen on as big a screen as possible. To complain that his skits are difficult or boring to sit through because they seem too close to the pain of daily life is to pay them some kind of a compliment.